Happy Friday everyone! Today I have an exciting review in my blog. As you can see, I bet you know what it is. Yes, it is the Real Techniques Core Collection Make up Brush set. If you watch youtube, you might know the duo's sister called Pixiwoo, Samantha and Nicola Chapman. Their brush range comes in sets and individuals ones. You can purchase Real Technique Brush in local Malasyia store, but aware that it is slightly expensive (cost like a high end makeup brush). I got mine from MakeupToolsmy. I heard so many good reviews for these brushes. The first real technique brushes that I have are the Blush Brush & Expert Face Brush. I am excited to tell you what I though about these brushes! For the set collection, it comes with a case that can actually use also as a brush stand. Not really using it actually. But it would be a great case for someone who just wanna bring a few brushes during travel. Everything comes neatly and looks expensive to me! This brush is light weight and firm to hold. The hair are made from synthetic hair. The shape of the brush is not dome but pretty round on the side. It is not stiff and dense like the Sigma F80. 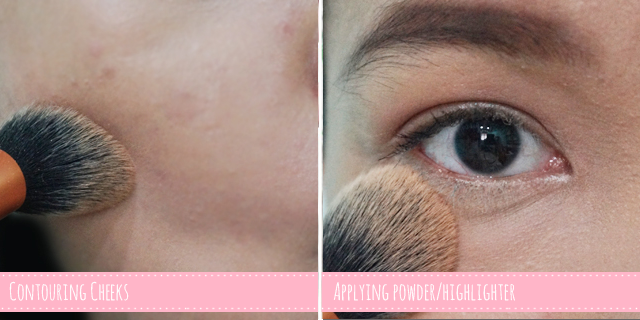 It is recommend to be use for liquid, powder foundation. I find that I love to use this for a very liquid texture foundation and buffering blush & bronzer. Also perfect to buff in powder to your face. It spread on nicely and feels soft on the skin. Sometimes this brush gives streaky effect if the brush is too dirty. My fault. Haha. This not your ordinary foundation brush. It is smaller than the normal ones and a bit flimsy. 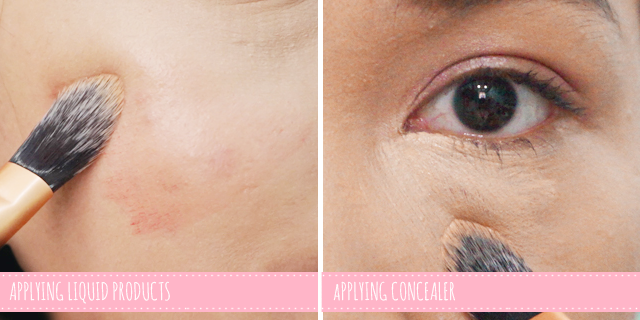 I find that this works best to blends in liquid product such as cheek tints and to apply concealer under the eye. 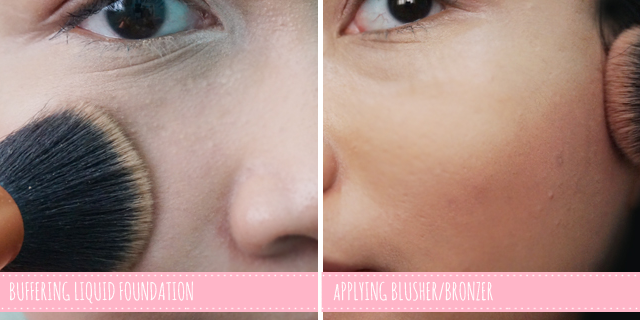 It also a great brush to blead uneven foundation around the nose and around the mouth. I find that it is a bit impossible to use this for your foundation routine because its pretty time consuming due to it size. My favourite brush in this collection! I love the size of this brush and how versatile it is. Perfect to apply powder under the eye to set my eye conceler. It is super soft and easy to clean. This also works great as a contouring brush. The pointed tip is going to give you a nice precise application on your cheek. Description : Precision cut to effortlessly conceal problem areas or use with lipstick for long-lasting shape and definition. Second favorite brush in this collection! I find that this is perfect to be use as a lip stick applicator, inner corner highlight applicator and also spot concealing. It is not that stiff and easy to work with. This should be sell individually! It is such a multi purpose brush. Overall. The Real Technique Core Collection is great for everyone especially when you are just starting to use makeup brushes. It is a versatile brushes. 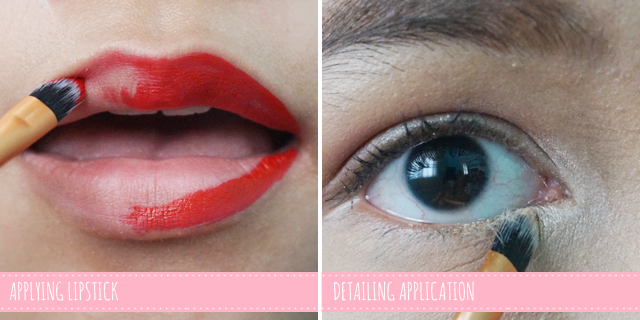 You can use one brush with many option of ways to your liking. I actually like the way how it weights. Its light and easy to handle. In terms of cleansing, it does not gives me problem. It is easy to clean and I do not have any shredding problems with these brushes. Price wise are also reasonable for such a great quality of brushes. Definitely recommend Check out other makeup tools from MakeUpToolsMy. All of theIR items are ready stock, 100% authentic and imported from the US, and you will also get free sample of beauty stuff with a purchase above RM100.00. Oh my god! I was literally doing research on brushes and this post is up! I'm looking for a foundation - buffing brush right now and this might be the one. I'm gonna check this out at local store first to see how it really works. Thanks so much for the review, Sab! BTW, if you wanna recommend similar buffing brush, I would totally appreciate that. Okay! I think my friend has the Sigma F80 and I'm gonna compare those two. For the makeup geek one, I'll search for reviews. Thanks, darls! what laptop did u use sab ? wished u showed ur full face after using the brushes...nice review!